After the revolutionary launch of The Ordinary only a month ago, I really wasn’t expecting much from Deciem. I knew they had their hands well and truly full trying to keep up with the demand for those products, but of course, we should always expect the unexpected when it comes to this wonderfully abnormal bunch. 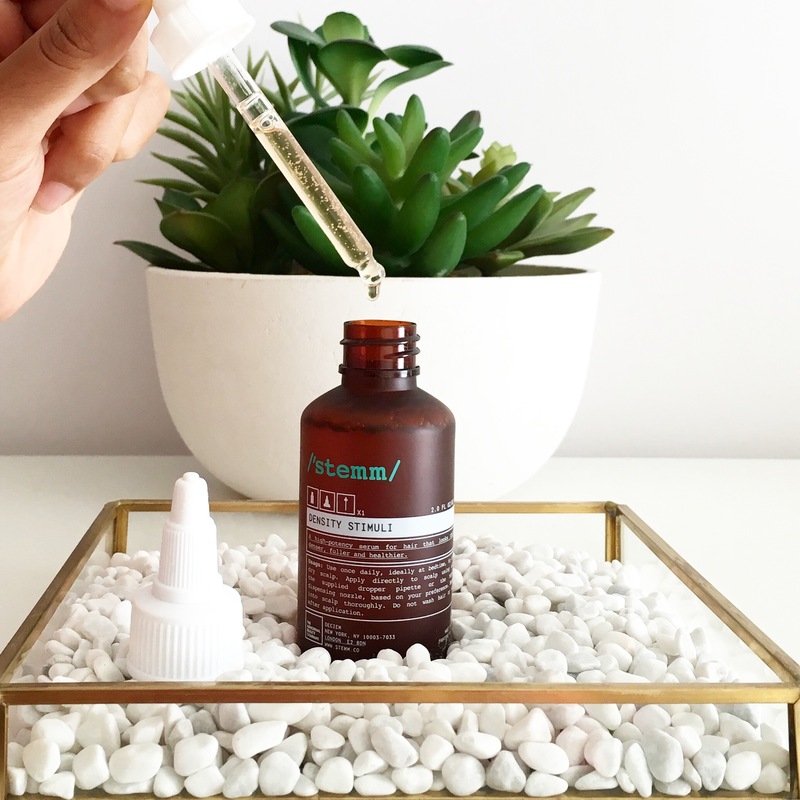 A week ago, this image appeared on both Deciem’s and Victoria Health’s Instagram pages with the caption: #tuesday – simple, mysterious and tantalizing but for me, an exciting reveal as I quickly put two and two together and realized that Stemm (I had seen the logo at the top of the Deciem website) would finally be launching in Victoria Health’s October Newsletter (released on Tuesdays) and it did. I guessed (because of the name) that it would be some sort of scalp focused hair brand but had no idea it would be quite like this and the response? Wow. According to Deciem, Victoria Health sold 2 months worth of projections in just 2 DAYS. I was lucky enough to receive my set on Friday and used all three for the first time Saturday night. Since many of you are so curious about Deciem’s latest launch I thought I would fill you in on my first impressions. Haircare has always been an area that I have struggled with over the years. I have very long, more wavy than curly but somewhat dry and frizzy, Indian hair that I have majorly neglected this past year or so. Travel, stress, lack of sleep, poor diet and just general exhaustion has meant that this summer I started to notice more shedding in the shower and when I brushed my hair than usual. Not only that, I usually go through a cycle of long hair in the summer (air dries quickly and doesn’t require heat treatment) and shorter hair in the winter (quicker to wash and heat style), but after a bad haircut just over a year ago, I didn’t cut my hair again until a couple of months ago, which meant that my continuously long hair was really weighing down my roots, to the point where just two weeks ago I felt my hairline was so noticeably thinner (my sister disagreed) that I started looking into remedies. Even though I have loved and used Living Proof’s brilliant PhD line on and off for about two and half years now, it didn’t do anything to help/prevent this change, so I knew I needed something different and just like that, along came Stemm. As we all know, great skin starts from within and in the same way, great hair starts at the root, literally. 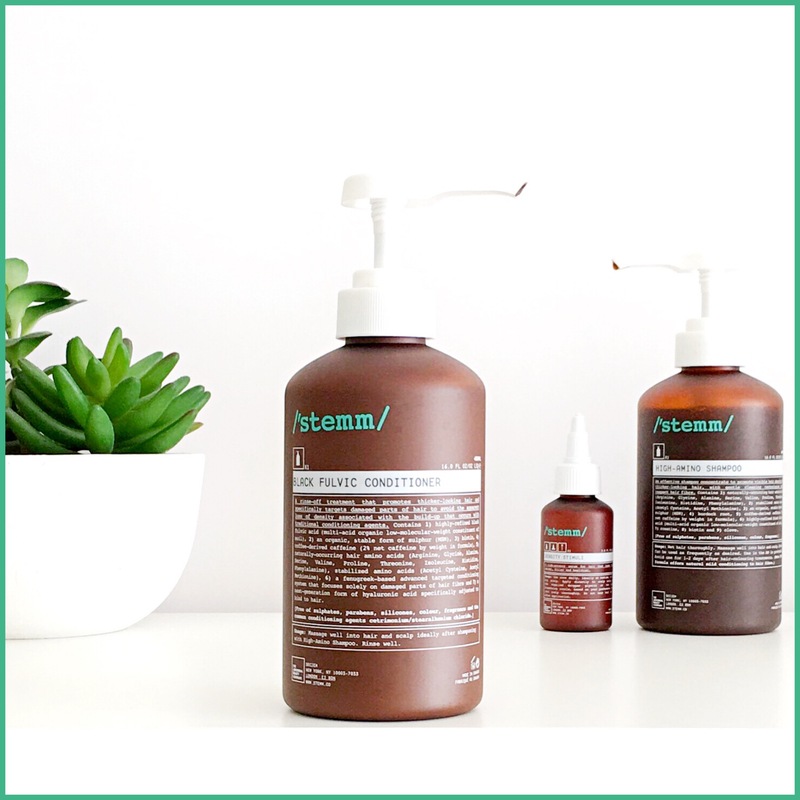 Stemm was created with this exact philosophy in mind and designed to support the scalp and promote healthy follicles, which in turn help maintain the quality of the hair overall. 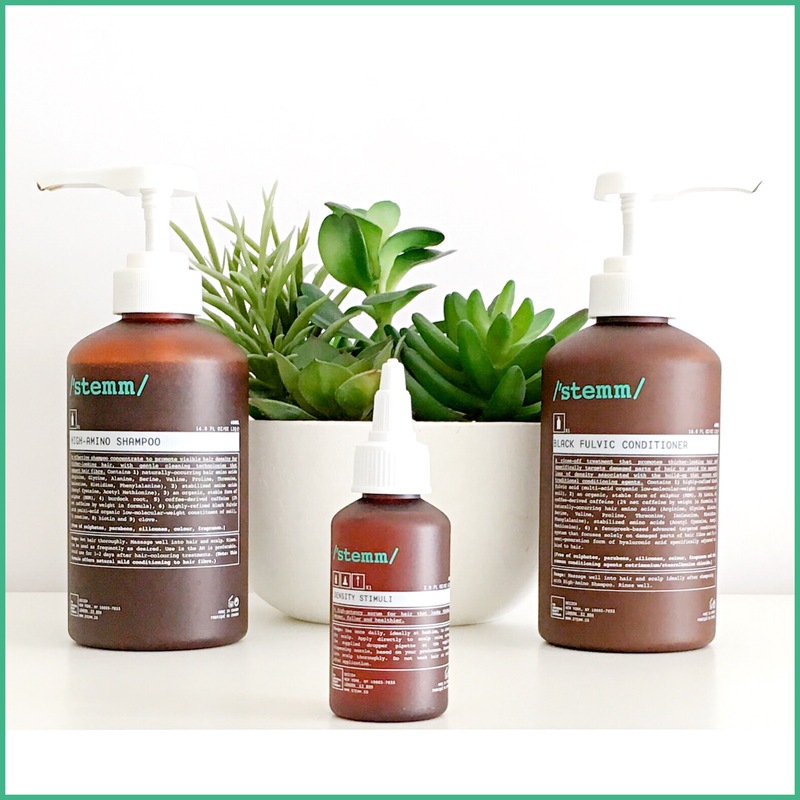 Technically Stemm is a hair loss treatment range because it helps to stop thinning and shedding and then also promotes regrowth and hair growth, but because of how great the ingredients are, anyone who struggles with dry, damaged, thin, limp, over-processed hair would greatly benefit from these three products. Ingredients: Aqua (Water), Cocoamidopropyl hydroxysultaine, Cetyl Betaine, Glycereth-7 Caprylate/Caprate Glycereth-7 Cocoate, PEG-175 Diisostearate, Caffeine, Dimethyl Sulfone, Lactobacillus/Eriodictyon Californicum Ferment Extract, Sodium Chloride, Lauryl Betaine, Acetyl Cysteine, Acetyl Methionine, Inositol, Arginine, Aspartic Acid, Glycine, Alanine, Serine, Valine, Isoleucine, Proline, Threonine, Histidine, Phenylalanine, Biotin, Creatine Monohydrate, Panthenyl Ethyl Ether, Fulvic Acid, Humic Acid, Sodium PCA, PCA, Sodium Lactate, Lactose, Urea, Milk Protein (Lactis Proteinum), Hydrolyzed Wheat Protein, Arctium Lappa Root Extract, Eugenia Caryophyllus (Clove) Flower Extract, Coffea Arabica (Coffee) Seed Extract, Origanum Vulgare Leaf Extract, Propanediol, Glycerin, Phospholipids, Lecithin Citric Acid, Sodium Citrate, Disodium Phosphate, Diethyl Phthalate, Propylene Glycol, Alcohol Denatured, Leuconostoc/Radish Root Ferment Filtrate, Sodium Benzoate, Phenoxyethanol, Chlorphenesin. Like everything Deciem do, this shampoo is so different from what’s currently available in mainstream haircare. 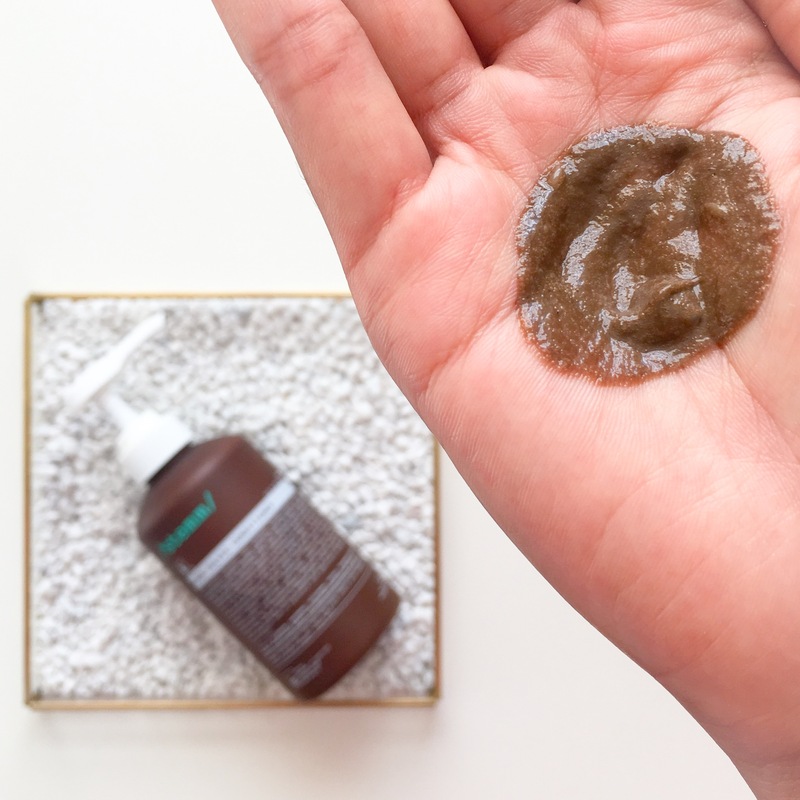 It has a fluid gel texture that smells incredibly earthy (very similar to the Voicemail Masque due to the lactobacillus ferment extract) and has a rich, caramel colour – both of which are natural. To get started, I fully wet my hair and then took two almost full pumps (I didn’t go all the way down) and began massaging it into my scalp. I found that it was easy to apply and spread across my scalp, but the first thing to note about this is that it does not contain any sulphates, so there is no foam. If you’ve never tried anything like this before then it will take some getting used to but don’t worry, it does produce a light lather the more you work it in. For my first shampoo I focused on the scalp and gently but thoroughly worked the product in before rinsing. Next I took 3 almost full pumps (remember I have very long hair) so I could work on the scalp again and the lengths too. There was a very slight tingling sensation due to the caffeine and when I rinsed it the water was a light brown (due to the natural colour), so those with dyed hair please don’t worry that it’s your colour coming out because it isn’t. What’s interesting about this shampoo is the mix of ingredients. There are amino acid shampoos, many caffeine shampoos and even a fulvic acid one (I’ve used this) but none that contain all three. It also contains ingredients like Biotin (a popular hair growth ingredient that improves the keratin infrastructure of the hair fibre) Burdock Root (rich in essential fatty acids, potassium, iron and amino acids to improve blood circulation, soothe the scalp and reverse hair loss), MSM (naturally occurring sulfur compound which strengthens and fortifies hair follicles) and Bilberry Polyphenols (antioxidant protection against free radicals and UV damage) that work together to promote hair density, health and volume, without stripping the healthy oils or damaging the hair fibre. This is a targeted treatment shampoo that goes beyond mere cleansing and I have been wishing for something like this for a very, very long time. As I’ve used cleansing conditioners and “no-poo” products before, I was not surprised by the texture or performance of this shampoo and like I said, if this is your first time it will take some getting used to, but stick with it as it’s actually better for the hair. Experiment with how much you need, starting with just a pump or two depending on your hair length, if you double shampoo (I almost always do) and how often you wash your hair (for me it’s twice a week) and go from there. The trick is to keep adding a bit more water as you work it in like they do at the salon and that will help activate the lather that many of you will be more familiar with. I am going to try using less next time and see how that goes and if it works I will update this post with that info. I think part of the reason Stemm have given us a lot of product is so we don’t feel we have to ration our usage and I really appreciate that. This is suitable for all hair types and is free from sulphates, parabens, silicones, colour & fragrance (as are the other two). This is all I’ll be using from now on so I will keep you posted on my progress. Ingredients: Aqua (Water), Cetyl Alcohol, Stearyl Alcohol, Lactobacillus/Eriodictyon Californicum Ferment Extract, Caffeine, Dimethyl Sulfone, Polysorbate 60, Fulvic Acid, Humic Acid, Hydroxypropyltrimonium Hyaluronate, Trigonella Foenum-Graecum Hydroxypropyltrimonium Chloride, Creatine Monohydrate, Panthenyl Ethyl Ether, Biotin, Acetyl Cysteine, Acetyl Methionine, Inositol, Arginine, Aspartic Acid, Glycine Alanine, Serine, Valine, Isoleucine, Proline, Threonine, Histidine, Phenylalanine, Sodium PCA, PCA, Sodium Lactate, Lactose, Lactic Acid, Urea, Milk Protein (Lactis Proteinum), Hydrolyzed Wheat Protein, Coffea Arabica (Coffee) Seed Extract, Origanum Vulgare Leaf Extract, Phospholipids, Lecithin, Xanthan gum, Disodium Phosphate, Citric Acid, Sodium Citrate, Diethyl Phthalate, Alcohol Denatured, Leuconostoc/Radish Root Ferment Filtrate Sodium Benzoate, Phenoxyethanol, Chlorphenesin. I first discovered Fulvic Acid almost three years ago now when I read about the brand Phylia de M in one of Victoria Health’s “increasingly famous” newsletters. At the time I was looking for supplements to get my health back on track and this seemed like the perfect accompaniment to everything else I was getting. Fulvic Acid is a highly nutritious element found in soil that feed plants, helping them grow strong and healthy. 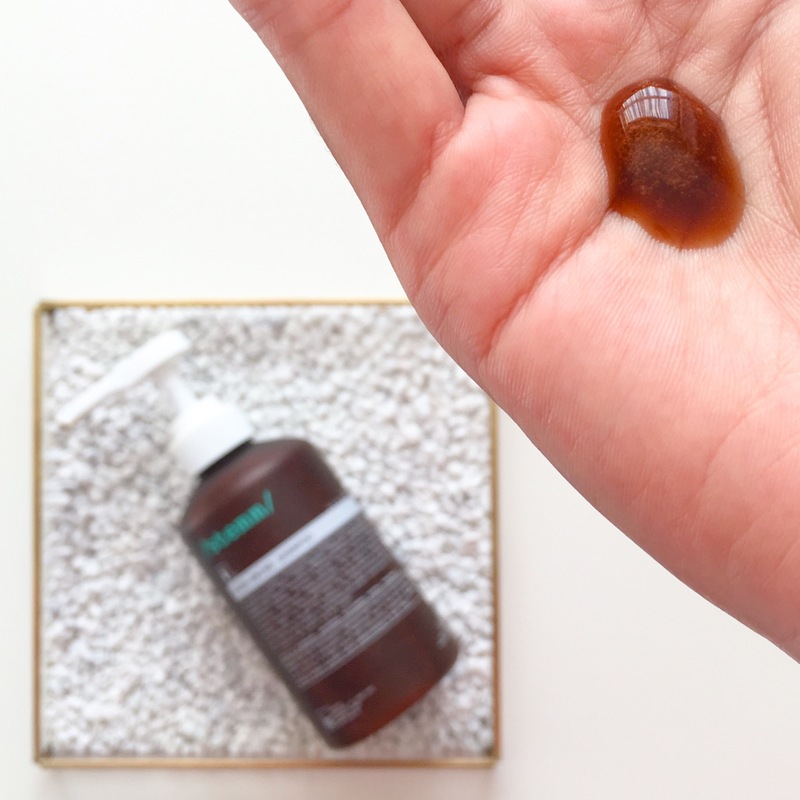 For us humans, Fulvic Acid serves as an incredible healer and is called a “Super Cell Conductor” because “it has the vital capability of realising the potential of all nutrients we consume”. This means that it activates the nutrients in the food we digest and makes our cells more receptive to them. It is a fascinating ingredient and Victoria Health’s amazing resident Pharmacist Shabir Daya has written an in-depth article on the subject here that I highly recommend reading. Basically, Fulvic Acid is an underrated wonder supplement that will help every other ingredient in these products perform even better. 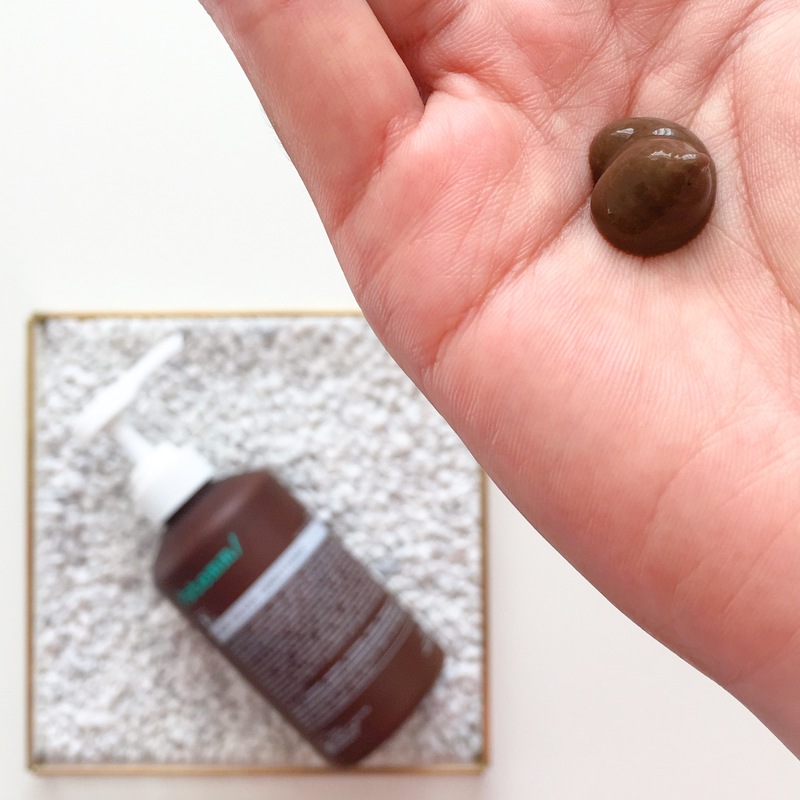 Just like the shampoo, this conditioner has a dark, rich, chocolate-y hue and the same earthy, woody scent, but one major difference is the texture. It has a light, thin, creamy consistency that is again, very different from traditional conditioners, which are usually very thick and heavy. Those with thin, fine or damaged hair will really like this, because it won’t leave your hair feeling weighed down or “coated”. I took two pumps of this and applied it directly to my scalp (which you really can’t do with most conditioners) and worked in it. I then took half a pump and applied it to the lengths of my hair and left it on for 5 minutes before rinsing. It applied and spread incredibly easily and again there was a very slight tingling sensation because of the caffeine content. This was a dream to use and more conditioners should be like this. 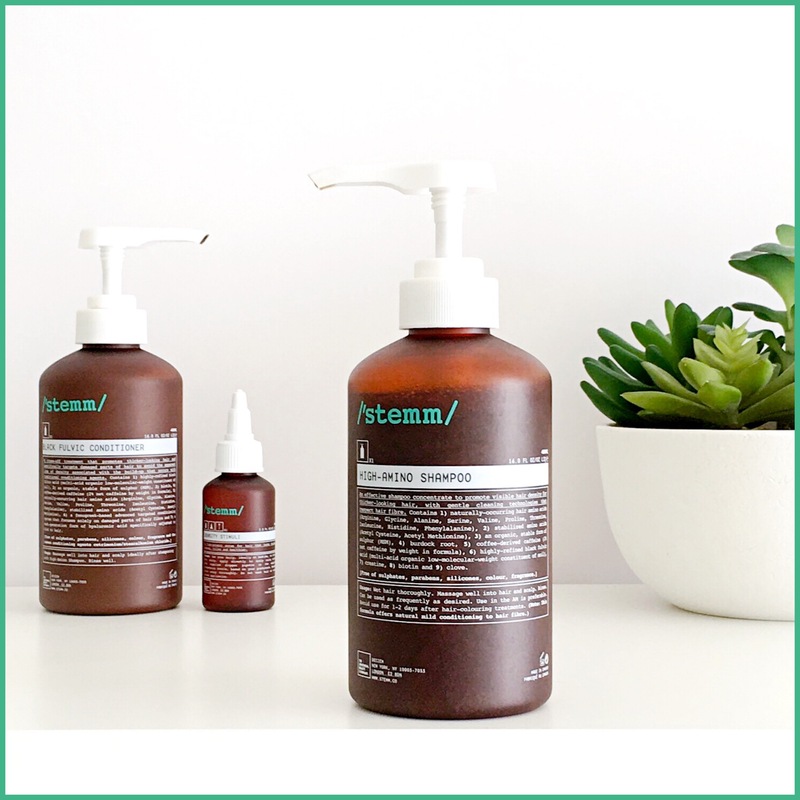 The ingredients of this are pretty similar to the shampoo with Fulvic Acid, Caffeine, Lactobacillus/Eriodictyon Californicum Ferment Extract, Biotin, Amino Acids, MSM and Burdock Root (to name the main ones). It also contains things like Fenugreek (an Indian spice that contains nicotinic acid and lecithin, which promote hair growth and follicle strength) to condition only the damaged part of the hair fibre, which means less product build-up; and a hyaluronic acid specifically adjusted to bind to hair to promote healthy, dense and voluminous hair. I really enjoyed how different this was to other conditioners I have used and think this will be a big hit. I’ll continue to use this along with the shampoo and update you on how it goes. Ingredients: Aqua (Water), Caffeine, Niacinamide, Propanediol, Butylene Glycol, Maltodextrin, Glycerin, Dimethyl Sulfone, Xanthan gum, Lactobacillus/Arundinaria Gigantea Leaf Ferment Filtrate, Biotinoyl Tripeptide-1, Biotin, Larix Europaea Wood Extract, Fulvic Acid, Humic Acid, Apigenin, Hydrolyzed Sodium Hyaluronate, Hydroxypropyltrimonium Hyaluronate, Sodium Hyaluronate, Magnesium Aspartate, Zinc Gluconate, Copper Gluconate, Calcium Gluconate, Acetyl Cysteine, Acetyl Methionine, Arginine, Aspartic Acid, Glycine, Alanine, Serine, Valine, Isoleucine, Proline, Threonine, Histidine, Phenylalanine, Inositol, Glucose, Maltose, Fructose, Lactose, Trehalose, Sodium PCA, PCA, Sodium Lactate, Panthenyl Ethyl Ether, Urea, Allantoin, Oleanolic Acid, Pisum Sativum (Pea) Peptide, Mentha Arvensis Leaf Extract, Glycine Soja (Soybean) Seed Extract, Epilobium Angustifolium Flower/Leaf/Stem Extract, Camellia Sinensis Leaf Extract, Lactobacillus/Eriodictyon Californicum Ferment Extract, Phospholipids, Milk Protein (Lactis Proteinum), Disodium Phosphate, Sodium Metabisulfite, Zinc Chloride, Sodium Chloride, Sodium Citrate, Citric Acid, Pentylene Glycol, Menthol, Menthyl Lactate, Hydroxyethylcellulose, PPG-26-Buteth-26, PEG-40 Hydrogenated Castor Oil, Sodium Hydroxide, Ethoxydiglycol, Diethyl Phthalate, Alcohol Denatured, Leuconostoc/Radish Root Ferment Filtrate, Potassium Sorbate, Sodium Benzoate, Phenoxyethanol, Chlorphenesin. I’ve always preferred hair oils to hair serums, but I have high hopes for this one. It’s a high potency, advanced leave-in scalp treatment that is meant to stop thinning and shedding, while also promote growth and regrowth. I was oh so close to repurchasing a somewhat similar product (here) despite not really seeing that much of a difference while using it, so I couldn’t have been happier when this launched. It’s the “peace of mind” product I was looking for to reassure me that I was at least tackling my current hair issues topically while I addressed the lifestyle/health side of things. I think if you have chronic hair problems like thinning, dryness, over-processing, damaged or an irritated scalp then this is going to be an important addition to your haircare regime. The mix of ingredients are so interesting and somewhat unusual, but they all come together to promote the healthiest hair possible, which we all want. 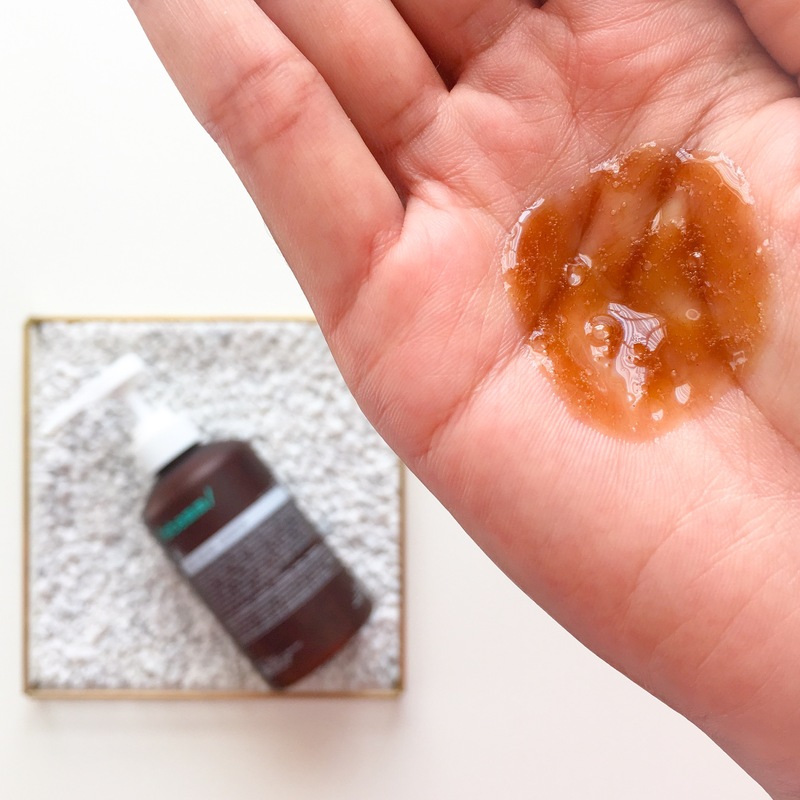 Density Stimuli has a watery gel texture that won’t run down your face when you apply it (I’ve had that happen before), but also won’t feel heavy and just “sit” on your scalp. You’re supposed to use this every day in the evening and apply it to your clean, dry scalp. This is important to note because I mistakenly applied it to my hair while it was still wet and while I didn’t notice anything adverse, I feel like it does somehow absorb better on dry hair. It has a very light brown colour and smells fresh and almost minty. I decided to only apply this to my hairline where I feel there has been some thinning and parted my hair into sections in the front and applied the serum directly to my scalp then gently massaged it in. There was slightly more of a tingling feeling as the caffeine is more concentrated (5%) but there was absolutely no irritation and actually my scalp felt soothed. This comes with a pipette and a nozzle for dispensing the product and I chose the nozzle as I preferred taking the tip right to the scalp to get the application as close as possible. The ingredients of this are again similar to both the shampoo and conditioner with the inclusion of caffeine, biotin, amino acids, fulvic acid and MSM etc, but with some key differences and concentrations. The caffeine is at 5% and it also contains niacinamide (great for skin but also an anti-inflammatory that helps promotes hair growth), zinc and cooper, silica, pea protein and green tea to really stimulate the scalp to prevent hair loss and promote healthy growth. This serum works to feed, soothe and activate the scalp because without healthy roots, it’s very hard to get healthy hair. I will be using this every night and will document my progress with it. I know that so many of you have already ordered your set with the amazing discount from Victoria Health and they should start arriving this week, so hopefully this post will give you an idea of what to expect. With haircare it does take time to see results and I will be keeping a record so I can do an updated post in a few months. On a side note, I can’t thank Deciem and Victoria Health enough for everything they are doing to change the beauty industry. Stemm and The Ordinary have had such an unexpectedly massive response and I know they are doing all they can to keep up with the demand, so please go easy on them. They are an amazing group of beauty obsessed nerds (that’s a compliment, by the way) working incredibly hard, but like someone perfectly commented on Instagram, they really need to stop underestimating how much support they have because #deciemania is real and when they launch something, we all want it! Disclaimer: This is not an ad or sponsored and no affiliate links have been used. Products were very kindly gifted by Victoria Health and all opinions are my own. I am so intrigued by this! I have very thick, dry, curly hair though, so I am a little hesitant given your description of the conditioner. Maybe I will wait until some reviews come in from the curly girls just to play it safe, plus I have plenty of my Josh Rosebrook nourish conditioner to use up. HI Arly, thanks so much for the review! I have short hair and currently still liking my foamy shampoo but this is very interesting! That’s so great! How are you getting on with them??? I got the set- was really excited. Been a Phylia de M user for years but was looking for something better. The shampoo I found smelt unpleasant, had to use twice or three times as much product as I use of my usual shampoo and even when I added water did not spread with ease at all. The experience was similar, although slightly better with the conditioner. The Density Stimuli I used on freshly washed but dry hair and didn’t notice anything unusual until the morning when I noticed that where I’ve put the Density Stimuli the hair felt very dry and dirty and was full of tiny white specs of the dried Density Stimuli. The feeling and look is very similar to that of putting dry shampoo for a few days. I am disappointed because I wash my hair twice a week and after using the Density Stimuli my hair looks like it needs washing again. There is no way I could use this every night as recommended. I will continue using Stemm at least until I finish the current three pack I got. However I will have to make a choice going forward. The only reason I am looking to move away from Phylia de M is the supply problem that Victoria Health keep experiencing. I’ve been using the Shampoo, Conditioner, Connect and Re-Connect for at least 3 years now and wow it did save my hair. I was losing my hair at the temples due to over-styling it when I was really young and was desparate. Used Phylia de M religiously and the difference it has made is amazing. It was not overnight -it took a good year for me to know it’s working. I used Phylia de M’s Connect and Re-Connect only on the temples where my problem was but now I’ve noticed a general thinning at the front so I need to target that area now. I was thinking that maybe the Density Stimuli should not be massaged into the scalp -maybe it just needs to be deposited there. I am used to massaging Connect and Re-Connect so maybe that’s where I am going wrong. However the instructions do say for Density Stimuli to massage into scalp thoroughly. Other than that, I take for hair vitamins and Aloe Vera juice from Holland & Barrett. Another underused but amazing thing is Castor Oil (Coconut oil too. I use 50:50 on hair as often as I can and sleep with it). It’s messy but it is a bit of a miracle worker. I had this experience as well. The shampoo and conditioner combo leaves my fine, thinning hair a tangled mess and it does not start that way pre-shampoo. I think it’s the conditioner, because my hair feels ok after the shampoo, but something about the conditioner seems to not work for me. I need to use another conditioner after to be able to comb out my hair at all. Also, as someone mentioned above, the serum leaves my hair dirty looking no matter how little or much I use, so I would have to wash my hair every morning, which I do not do. Not sure how to proceed, because I do like the ingredients, just not how they are delivered. Hi Lady’s I too have been using the Phylia rage for a few years now due to my thining hair genetic ,I was just about to order Stemm but am now having a rethink since my hair is very fragile I do not want to use any thing that could make it more prone to breaking. 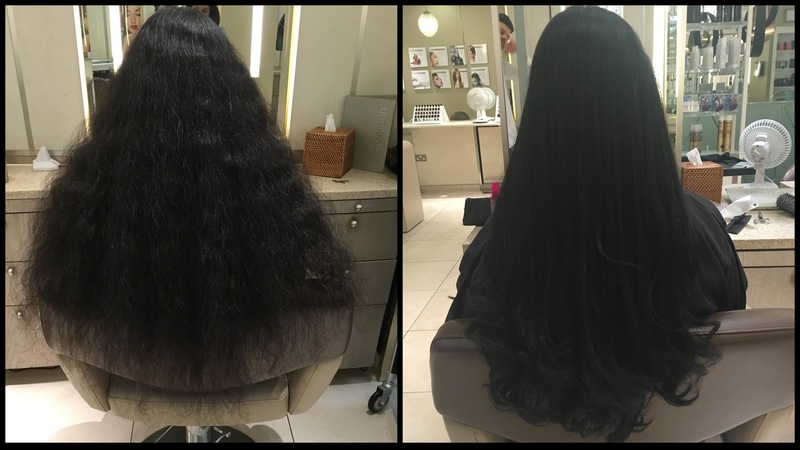 I tried the Aveda hair loss prouducts and found that they made my hair hard dry and unmanageable. Think I may stick with Phylia. I have tried Superior Hair but after two months of use began to have problems. Hives, indigestion and sleeplessness ( research suggests may be the saw palmeto.) These side effects returned when I restarted the pills. I also found it hard to take the large pills three times a day as directed. Having good results with Phylia so sticking with that. Hi everyone, I too was excited about this range and have now used all 3 products. I’ve only just started so can’t comment on any improvements yet but I have to say I really don’t like the density stimuli at all. It makes my hair unbelievably tacky, sticky, brittle and unmanageable. I can’t see how you can only get it on the scalp and not your hair. I’m a man in my early 60s and have a full head of hair and plan to keep it that way so I thought I’d try this range to stabilise what I’ve already got. I have absolutely no problems with my hair other than a little thinning which is why I wanted to try these products. The shampoo is fine, the conditioner is fine but I really don’t like the serum. My hair looked absolutely awful after it. I only wash my hair twice a week but after using the serum I feel I have to wash it every day now (which I really DON’T want to do). Anyone else left with dry, brittle hair after using this serum? Hi, like others here, I have found the density serum to make my hair dry and brittle and, also like others, I only like to wash my hair once or twice a week. You mention above, several times, that you will have an update coming; have you written one? I did a search but can’t see anything new. Thanks. hey arly, are you still using the stemm products? what are your final thoughts on it one year later? Hello! Sadly, I am not. They absolutely work, but I have found them very hard to use with my hair type. 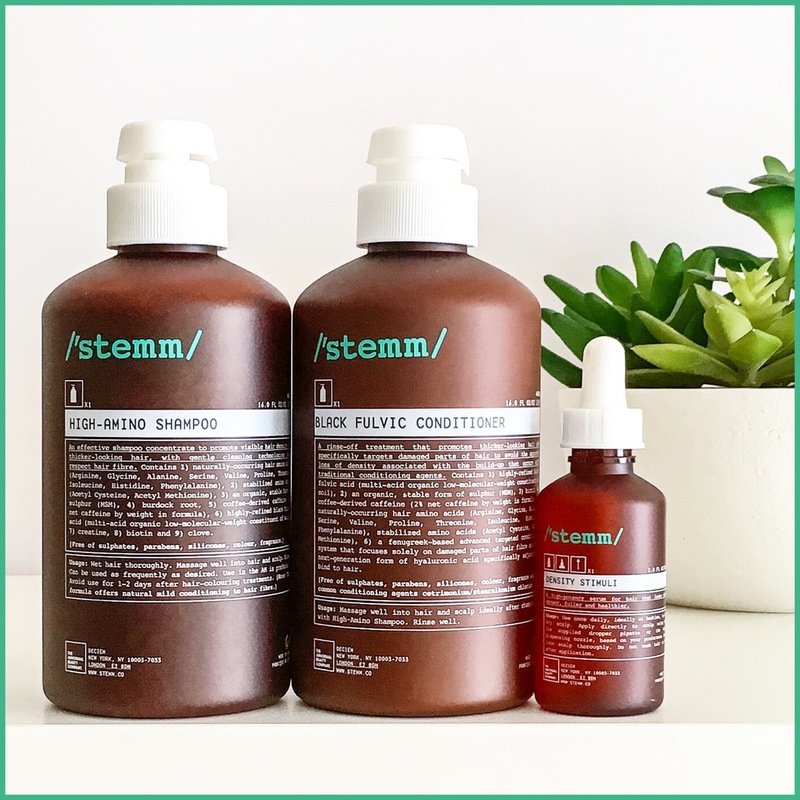 I do want to do an updated post all about haircare because I am currently using a mix of HIF (Deciem’s other haircare brand) and Shea Moisture and I find those products much more user friendly. Hi. will there been an update anytime soon? Yes! I am currently on a break from blogging for personal/family reasons, but should be back with an updated haircare post next month. Hi! I am struggling with recent hair loss/”thinning” and am looking for reliable, honest products that really do help. It is difficult to find them through all of the promotion and hype. What conclusions have you come to regarding Phylia and Stemm? Are they worth the hype/$ or is there a different/better solution out there? Hi Dane, I completely understand what you’re saying. I liked both Phylia and Stemm, although Stemm wasn’t particularly user friendly and is now being reformulated.